Parents are encouraged to watch our classes. We don't have any secrets. We make it super easy. Just arrive at the scheduled time listed under Sydney karate Locations on this website. If you can, get there about 10-15 minutes before class to fill out a standard athletic waiver form. You do not need to call ahead to book in. 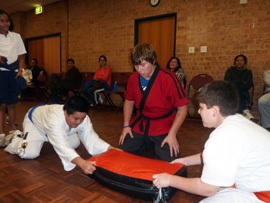 Please read Sensei Matt’s post on Your Child’s First Day of Martial Arts. The first class of each term is $16. Each additional class is $14. The $2 is our rego/membership fee, which is the lowest in Sydney. If you pre-pay for the entire term, it works out about 12% cheaper. Families with three or more pay $12 weekly per class for each student. We accept cash and cheques; sorry no credit cards. Fees should be paid prior to the start of each class, unless prepaid for term. What if I just want to watch? You are welcome to watch before joining, and parents are encouraged to watch our karate classes every week. We do not offer free classes because our classes are some of the most popular in Sydney and also the most affordable. We do not offer lock-in contracts so there is no risk. Loose fitting clothing and soft-soled shoes for the feet are recommended. Karate uniforms may be purchased at any time but are not mandatory. They cost $45. We limit new student intake to the first three weeks of the term so a new student can join during week 1, 2 or 3 of any term. We do this so children do not get too far behind their classmates. Your child can play with the other students until the class begins. We then bow in and start the class with a fun warm up game, giving each student a great chance to get to know their new classmates. We usually start the class in a circle so that all students feel equal and they are all in the “front” of the class. We keep them moving so there is no time for boredom! Our grading fees are included in the class fee, which is unusual for a martial arts organization–and a big plus.